A little bit of this, a little bit of that…a card, a winner and another giveaway! And with that title, I am now singing “Anatevka” in my head and finding myself a bit distracted from getting down to writing. Oh, how I love the soundtrack from Fiddler on the Roof! In any event, here I am, finally! Sorry it’s been way too long between posts but LIFE has just been way too busy lately. First off, the winner of the handmade chevron and crystal mezuzah…comment #1 Dena from the fabulous Jewish style blog, Chai & Home. Second, I just have a to share a fun card I made yesterday for a friend’s birthday. It was my first attempt at a “shaker” card where the glitter or confetti actually shakes inside a window. My base is none other than my favorite Curious Metallics White Gold cardstock. I then cut out this fun wine bottle shape, which I modified with a window, from Curious Metallics Gold Leaf using my Silhouette. Then I adhered window plastic to the bottle, arranged foam squares around the edge to make a frame, filled it with metallic confetti and adhered it to the card. I will say that the confetti did sort of stick around the edges so not sure how to avoid that but overall I am quite pleased with the result. 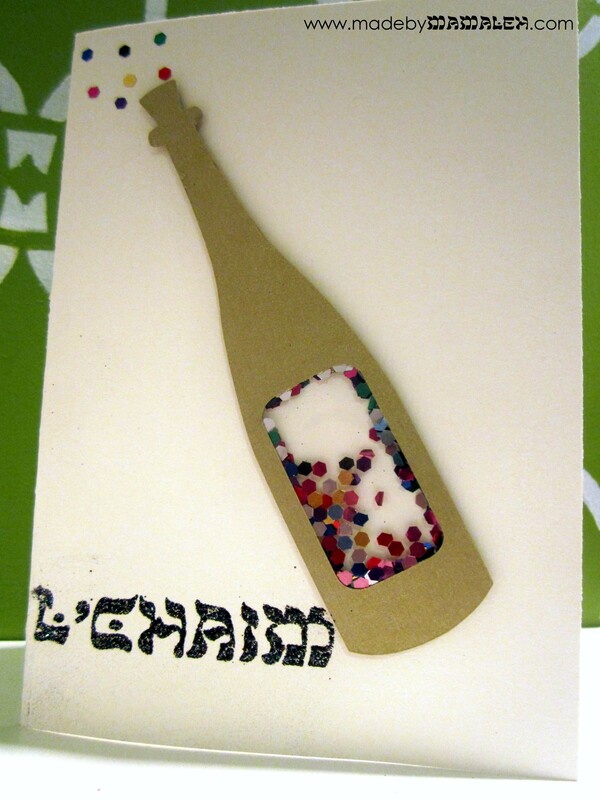 For the sentiment I stamped the fun “L’Chaim” stamp I found on ebay and then embossed it with black sparkle embossing powder. 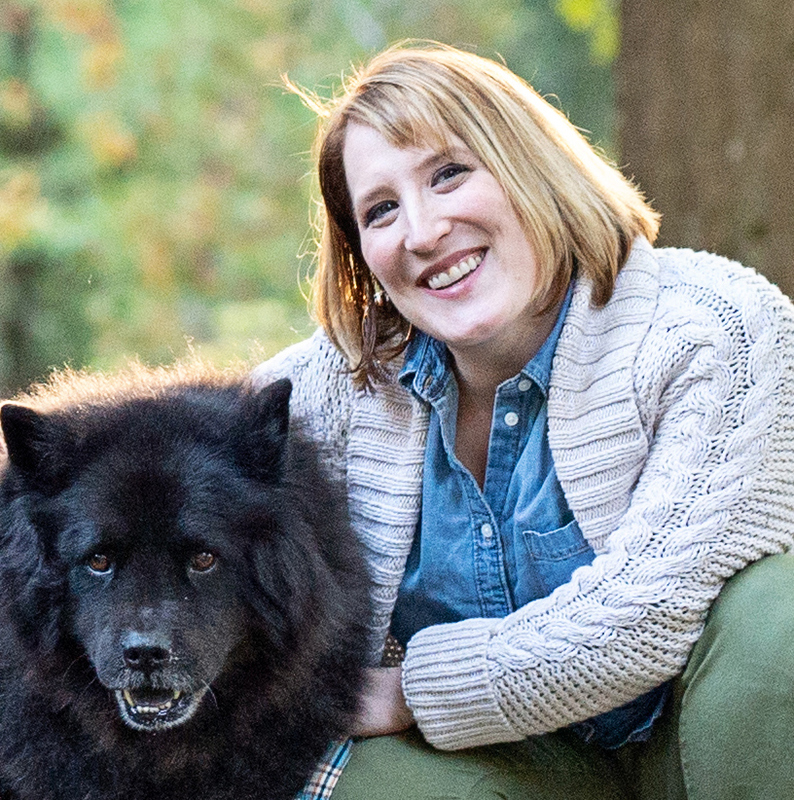 Finally, I promised you at least one more giveaway for my blogoversary and since April isn’t over yet, there is still time for one final celebration of the fact I have been blogging for an entire year! I am so excited about this I can hardly type! The lovely Lauree at 1-800-Dreidel put together the most fabulous box of goodies valued at just over $55 to send to one of you, my dear readers. There are stickers, cupcake toppers, ribbon, cookie cutters, a paper punch, beads and more! It’s so fun! You’ve heard me mention 1-800-Dreidel before – they are one of the few places that cater to Jewish crafters and have a great selection – it’s my go-to source for wine charms and the customer service is fantastic! Check them out! And as another special treat, you can get 10% off your entire first order by entering “Mamaleh” in the customer comment box. Remember, you must click-through after leaving a comment for your entry to be counted. Not on FB, you can enter here. Good luck and thanks for helping me celebrate a year of blogging! This entry was posted in Crafts, Giveaway, Handmade Card and tagged giveaway, Giveaway winner, handmade card, jewish crafts. Bookmark the permalink. Wow — cards, scrapbook layouts, holiday decorations — so many things to do with all those goodies! Thanks for offering them. 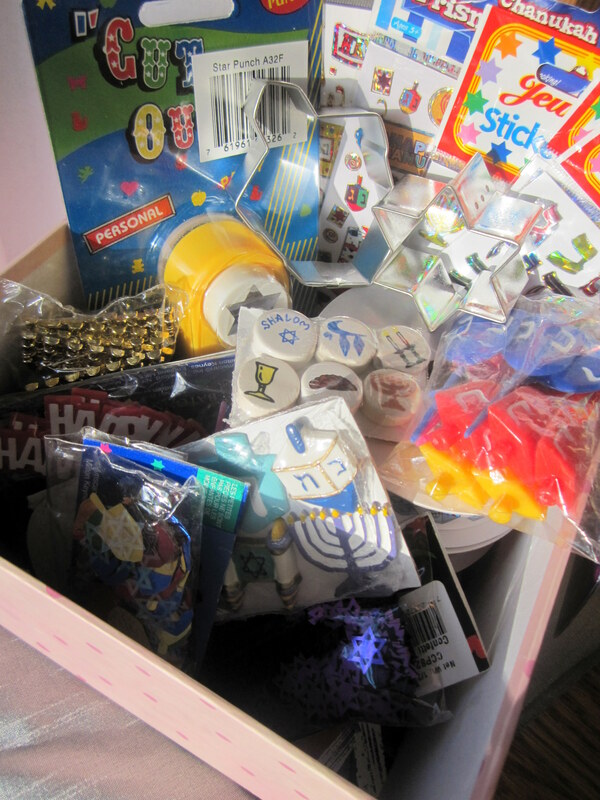 Such fun looking Jewish crafty materials. We are all into crafts lately in our house and would love more new supplies to play around with! Thanks for your generous giveaway! and thank you also for giving an alternative to facebook. Happy (late) Lag B’Omer and counting down to Shavuos. By the way, I don’t do Facebook. Can I still be entered for the giveaway? Your blog is so upbeat and my grandson really enjoyed wearing his 1st pesach onesie. Actually he was indifferent, but we all enjoyed seeing him in it. Thanks again and I would love to win this package too.